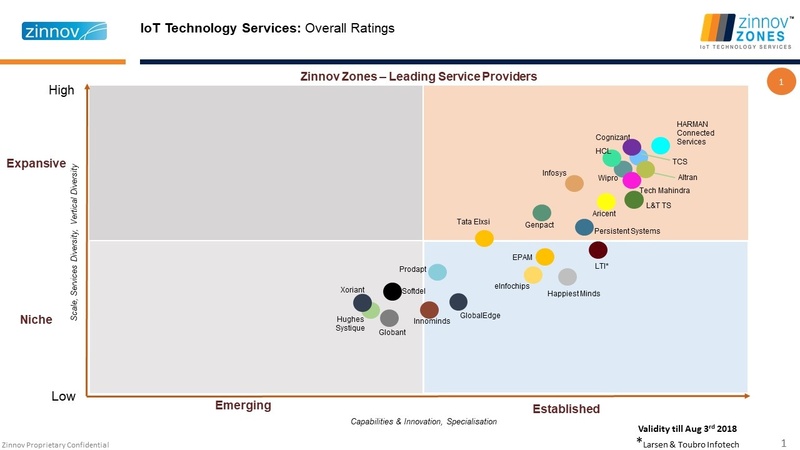 12-10-2017(NEW YORK)—Prodapt Solutions, a technology, and services innovator, has announced that Zinnov has positioned it as a niche and established player in its Zinnov Zones 2017 IoT Technology Services. Here is the overall ranking of Prodapt among industry’s leading service providers. This is a study that analyzed the Global IoT market and trends from both the buyers’ and service providers’ perspectives. Zinnov evaluated Prodapt’s key capabilities in the IoT domain through their in-house SynaptTM framework, the success stories, and the strong R&D investments. Prodapt approaches the market with a deployable solution for a focused set of verticals. The focus on select opportunities in energy efficiency as a service (EEaaS), smart building, oil & gas, and connected worker, gives Prodapt the ability to identify best-of-breed partner technologies and develop deployable solutions with demonstrable ROI. “Prodapt has marked its position as a niche and established service provider in IoT technology services. With its strong Synapt offerings, energy management solutions, and communications competency, Prodapt has demonstrated capabilities to build leading smart solutions,” said Sidhant Rastogi, Partner & Practice Head, Zinnov. Established in 2002, Zinnov has presence in Bangalore, Gurgaon, Silicon Valley, and Houston. Zinnov has built in-depth expertise in Product Engineering and Digital Transformation. With a strong foundation in Research and Strategy Consulting, they enable clients to accelerate growth and create efficiencies through innovation, productivity, technology, and cost savings.